The Take That pop group are a boy band from the UK of which singer Robbie Williams used to be a member of this once five man act. Now a four man band, Take That have recently got together again and are achieving success with their fresh hit pop songs. 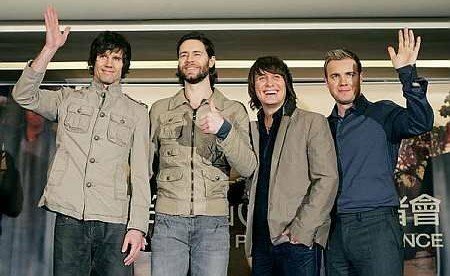 The four group members are, Mark Owen, Howard Donald, Jason Orange and Gary Barlow. Labeled as one of the most successful pop groups in Britain since The Beatles, Take That were formed in 1990 and originally sold more than 25,000,000 albums in the space of 5 years. This popular boy band split up in 1996 to the disappointment of pop music fans all over the world, not only in the UK. Robbie Williams was partly to blame for the break up of Take That after disagreements between Williams and Gary Barlow which eventually led to Robbie walking out of the band. Among the discography of Take That is their “Everything Changes” album released under the Arista, RCA record label in 1994 and in 1996 their “Greatest Hits” record, both of which became best selling albums of the decade. The question on everyone’s lips about the Take That pop group was how many hit singles could they now produce and which one’s would make it to number one in the UK pop charts and other music charts around the world. In May, 2006 the first studio album recorded in more than ten years was added to the Take That discography and set to take the world charts again by storm. In 2007 they went on tour which was criticised highly by music critics and went on to be a sell-out. The song “Patience” won the best British single award in 2007 and the band performed live at the BRIT awards. Nominated for as many as four BRIT awards during 2008, it is clear to see that this boy band from England are going to be around for a while yet and with a new album due for release in November 2008 the Take That pop group are sure to deliver a few more chart topping hit songs.